The Underwater Explorers Society, which was established in 1965 on Grand Bahama Island, has become known in diving circles as the most sophisticated dive facility in the world. This full service dive center not only has pumps and compressors but deepwater tanks and dive boats used for dive instruction as well. What makes the Underwater Explorers Society stand out most from other dive centers is its professionally guided encounters with free-roaming sharks and dolphins. For vacationers who want to add a touch of danger to their vacation this is definitely the place to go! The main goal of the well knowledged staff at the Underwater Explorers Society is to provide vacationers with a fun and memorable experience in a safe environment. One need not be an experienced diver to enjoy the unique opportunities the Underwater Explorers Society has to offer. The Dive Today! program, which is a half day course, teaches the basics of diving, first in a pool dive and then in a reef dive. The Learn to Dive Vacations Scuba Diver program goes one step further by certifying vacationers to dive anywhere under the supervision of a diving professional. Instruction begins even before arriving on Grand Bahama Island either in the form of a videotapes or CD-ROM. Once on the island the course lasts a day and a half and includes pool and ocean dives. 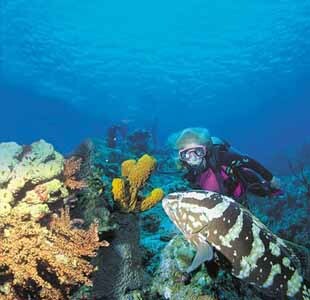 The Learn to Dive Vacations Open Water Diver is a two day course that results in certification as on Open Water Diver. This means that during future dives no diving professional is needed ( only a dive buddy ) and divers may rent or purchase their own equipment. The Open Water Referrals is the mac daddy of all of the learn to dive courses. This program is for divers who want to complete their open water training. Proper paperwork must be provided by instructors from previous classes in order to participate in this two day, four dive program. The price of each course includes all materials, diving equipment and professional instruction. For vacationers who want to brush up on their diving skills the Underwater Explores Society has several options. The Advanced Open Water course introduces divers to specialty areas such as night dives, wreck dives, and navigation. The Rescue Diver course teaches accident prevention. Over three days divers will learn and put into use rescue skills and techniques. The Underwater Snapshot course takes place in a classroom and teaches the basics relating to underwater photography. The price of this course includes one day use of underwater camera equipment. The staff at the Underwater Explores Society encourages all visitors to capture their fun diving experiences on film. The goal of The Marine Awareness course, which includes a medium reef dive, is to teach divers about underwater life and the importance of preserving the natural habitats of these creatures. What makes the 13 dolphins that live at the Underwater Explorers Society facility so unique is the freedom they are given in which to roam. Although they live in pens, the dolphins are released several times a week in order to swim with divers. It is up to the dolphins whether or not to return and they always do! 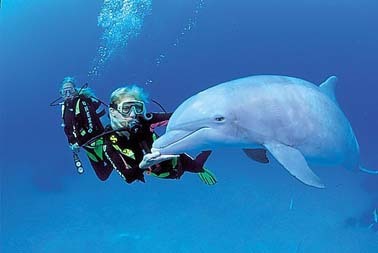 Those who participate in the Dolphin Dive will have the extraordinary opportunity to swim with these graceful creatures. 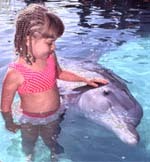 Divers will also get to hand feed the dolphins and have their pictures taken with them. Looking for a more intense experience? The Shark Dive allows divers to swim in close proximity to sharks of various shapes and sizes. A shark feeder from the facility will hand feed and pet the sharks. This dive experience provides for many unique photo opportunities. 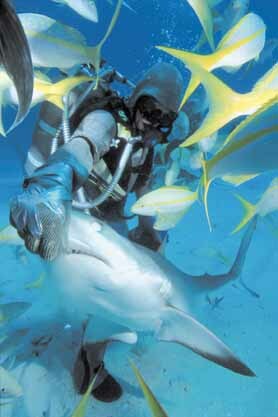 The Shark Feeder program is the most cutting edged experience out there for experienced divers. The well knowledge staff will teach you how to use a chain mail suit properly as well as shark behavior and handling procedures. Divers will put this instruction to use during an adrenaline rushing underwater adventure. This four day course includes a video of the experience, a photo album and an engraved wall plaque with photo. This dive is not for those who scare easily. For more information please call the Underwater Explorers Society at 1-800-992-DIVE.